Storm is a very affectionate and loving seven month old bunny. He enjoys laying down with the person he’s bonded with (he bonds with people very easily as well) and would spend an entire hour licking and grooming you. 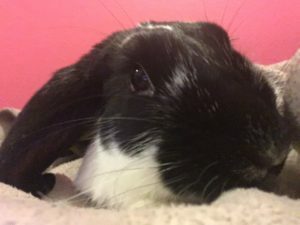 I’ve had bunnies before, but none of them has ever been as affectionate and as sweet as Storm as bunnies typically like to be left alone to do exploring on their own. He only poops in his cage unless he’s marking a new territory (in that case, just scoop it up and put it back in his cage so that he knows that’s where it’s supposed to go) and loves to binky, jump, and sprint through the room to express his happiness. I’m giving him away only because I have no time to care for him anymore, and he deserves someone who has enough time to ensure he’s let out of his cage everyday and get the amount of love and attention that he deserves. I want him to go to a good and loving home because that’s what he deserves.